Previous Clubs: Real Madrid, Budapest Honved (Kispest AC). International: Hungary 85 caps 84 goals. Trophies Won: Hungarian League 1949/50, 1950, 1952, 1954, 1955, Spanish League 1960-61, 1961-62, 1962-63, 1963-64, 1964-65, Spanish Cup 1961-62, European Cup 1958-59, 1959-60, 1965-66, Intercontinental Cup 1960, Balkan Cup 1947, Olympics 1952, Central European Championships 1953, Hungarian Football Federation Player of the Year 1950, Central European International Cup Top Scorer (10 goals) 1954, Hungarian Golden Boot 1947-48, 1949-50, 1950, 1953, Spanish League Golden Boot (Pichichi Trophy) 1959-60, 1960-61, 1962-63, 1963-64, World Soccer Player of the Year 1953, European Player of the Year 1953, FIFA World Cup Golden Ball 1954, European Cup Top Scorer 1960 (12 goals), 1964 (7 goals), World Golden Boot 1948 (50 goals). Career Totals: 529 appearances, 514 goals. If ever there was a footballer whose looks were deceptive it was Ferenc Puskas, as England found out to their cost. "Look at that little fat chap. We'll murder this lot," was the judgement of one England player before a Wembley friendly against Puskas' Hungary team. England had never been beaten by a foreign team at Wembley before this match. Puskas inspired Hungary to a 6-3 win, scoring 2 of the goals himself. Just to prove it was no fluke, they played a second friendly the following year in Budapest, where Hungary won 7-1, with Puskas once again notching two. 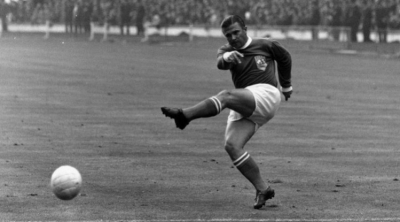 On the face of it, Puskas should not have been as great, and I do mean great, as he was. He was short, round and poor in the air, even seeming to go as far as actively avoiding using his head. He was also completely one footed, with an over reliance on his left foot. What a left foot though! Even after retirement it was a cannon so powerful and accurate that a spell coaching in Vancouver ended because he had demoralised the goalkeepers with the sheer power of it. Puskas was a goalscorer of supreme quality, even overshadowing the great Alfredo di Stefano, in terms of goals scored, when the pair played together. As the greatest goalscorer of them all, certainly in the 20th Century, as recognised by the International Federation of Football History & Statistics, it was fitting that FIFA chose to name their award for the scorer of the most beautiful goal of the year after him. It does make you wonder how many goals Puskas could have scored if he had not been banned for 2 years by FIFA for the crime of defecting from a Hungary that had been taken over by the Soviet Union. While some people might discount his goalscoring exploits in Hungary, as they might not see the level as top class, but it is impossible to discount his goals for Real Madrid, after joining them at the age of 31 following his 2 year FIFA ban. He was top scorer (Pichichi) 4 times and scored 7 goals in 2 European Cup finals, Puskas had already scored 3 goals in the first 2 games of the 1954 World Cup when he suffered a fractured ankle. He returned in the final, still suffering from the injury, and scored one goal and had one controversially ruled out for offside. Four hat tricks in his first season in La Liga, despite that 2 year ban, and he eventually played 180 times in La Liga and netted 156 times. He ended his time with Madrid having scored 324 goals in 372 games! The 'Little Cannon', as he became known in Madrid, was more than just a goalscorer, he had vision and skill too, as then-England captain Billy Wright found out when England met Hungary at Wembley. When he dragged the ball back away from him, "Wright went past him like a fire engine going to the wrong fire", according to The Times newspaper at the time. The final word should really go to his Hungary team-mate, goalkeeper Gyula Grosics: "He had a full career in Hungary and he repeated it in Spain with Real Madrid. That is why he is not only world class, but he belongs to the world of dreams."